YOU GET A SCRUB DADDY, AND YOU GET A SCRUB DADDY, AND YOU GET A SCRUB DADDY, AND WE ALL GET A SCRUB DADDY! HEY, HI, HELLO! Who here just LOVES cleaning? Clean, clean, clean, I could do it all day, so much fun!!! Haha, jk, cleaning is the WORST. And if you're one of those people who cleans for enjoyment, then #bless your soul and teach me your ways. For those of you who are like me and despise cleaning with a burning passion, then let me introduce you to a product that'll make cleaning so much more simple, and dare I say, maybe even, like, fun? Meet the Scrub Daddy! Most of us were first introduced to this smiling sponge back in 2012 when it appeared on Shark Tank and got a deal from Lori. And it's easy to understand why Lori loved it so much. One of the biggest selling points of this adorable scrubber are its versatile uses. You can use it on surfaces in various rooms (like the kitchen or the bathroom) or you can target it on specific items (like to get rid of fussy residue on dishes). Another A+ selling point? They're smell-resistant! Ever open a new sponge, all excited it's so clean and new, and in a matter of weeks — sometimes as short as two weeks — it's stinking up the entire sink area in your kitchen? Not this guy! See, this guy will erode away in about a month, but he won't leave a funky smell. WHAT MORE COULD YOU WANT IN A DADDY??? Hehehe. 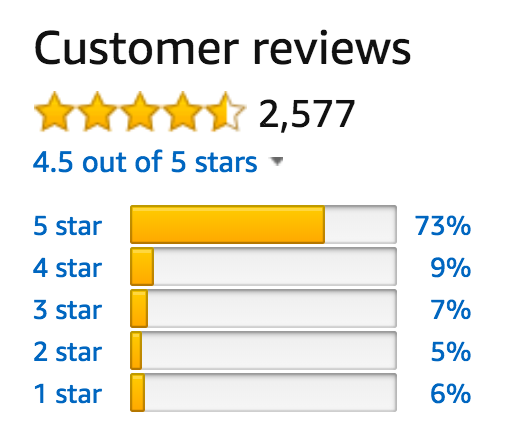 I should probably also casually throw in here that the Scrub Daddy has over 2.5K glowing reviews on Amazon with a 4.5/5 star rating, and passes Fakespot with an A.
NBD or anything, but that's like, really freaking amazing. 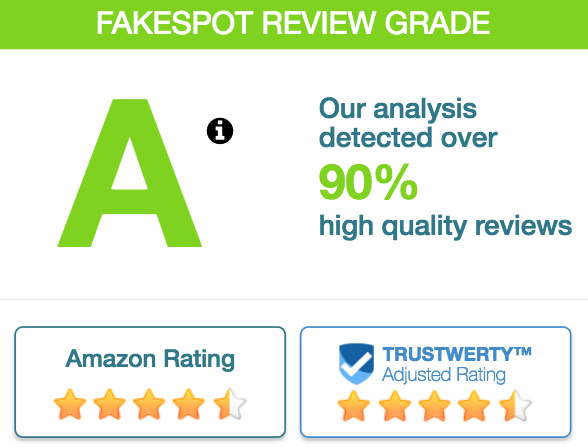 If you need even further convincing, just check out the amazing reviews! This clean freak reviewer swears upon the magical powers of the Scrub Daddy. And this reviewer found a unique way to use her Scrub Daddy — to get a dried paint stain off of her clothes. Not all heroes wear capes. "Not long ago, Scrub Daddy came to my rescue in an unexpected way. As an artist, I work with acrylic paints and recently, I accidentally got a little paint on the wrist cuff of my blouse that was not adequately protected by the paint smock I was wearing. I didn't notice it at first, so it dried completely. I had nothing in my supplies to clean it off. So I used a piece of scrap material with soap, but the dry paint was not going to budge. Then I spotted my Scrub Daddy on the sink ledge. I decided to give it a try with some of the soap. Lo and behold, I could see the paint coming off as I kept scrubbing. Eventually it was completely 'erased.' This may not work on some fabrics, but on this cotton top it worked beautifully." —C. L.
And this reviewer quite simply believes that if you're not already the proud owner of a Scrub Daddy, then you should change that fact immediately. A sponge that quickly adapts from hot to cold water temps? Check. A sponge that doesn't absorb and emit nasty smells? Check. A sponge that won't scratch your surfaces and valuable belongings? Check. A sponge that's really darn cute and has an adorable smile? ALL THE CHECKS. Do your home and yourself a favor and get a four-pack of the Scrub Daddy from Amazon for $14.99. ^You after trying the Scrub Daddy once.